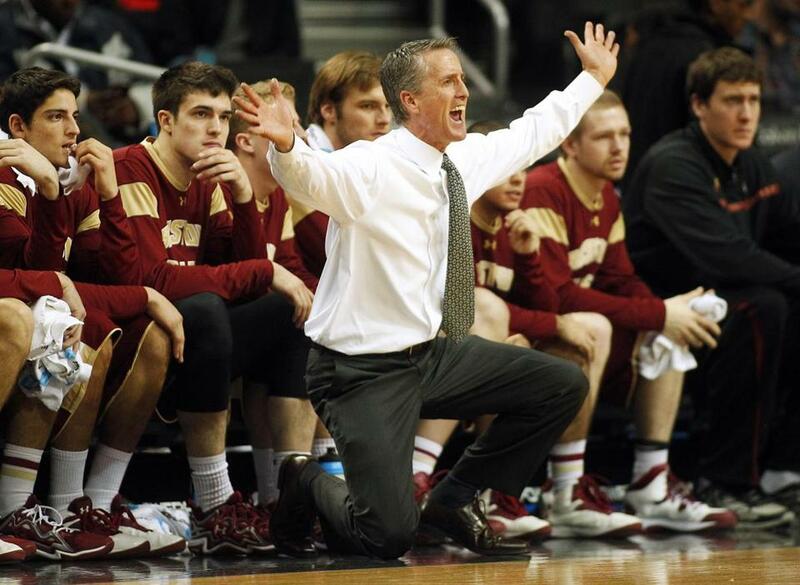 The BC basketball program seemed to regress in Steve Donahue’s tenure. Steve Donahue seemed to make an eloquent case in support of his return for a fifth year as Boston College basketball coach after a 73-70 overtime loss to Georgia Tech in the first round of the Atlantic Coast Conference tournament a week ago in Greensboro, N.C.. In his summation why the future appeared promising, even after BC suffered through the worst season in its basketball history with an 8-24 campaign, Donahue said the team would return its top seven players: three juniors, two sophomores and two freshmen. “We haven’t coached a senior here yet,’’ Donahue said, plaintively, in his postgame remarks. But Donahue, 51, will not get that opportunity. BC fired Donahue Tuesday with two years remaining on his six-year contract after he went 54-76 over a protracted four-year struggle in the ACC. Last Thursday, Sports Illustrated reported Donahue was returning for a fifth season. A look at some of the coaches that might be on BC’s short list to replace Steve Donahue. Donahue’s final season at BC, one which he described as “the craziest year in my 30 years of coaching,’’ was highlighted by a 62-59 overtime victory at Syracuse Feb. 19 that knocked the top-ranked Orangemen from the ranks of the undefeated. But that wasn’t enough to sway BC athletic director Brad Bates from parting ways with Donahue six days after the conclusion of the season. It set into motion a search for Donahue’s successor BC sources indicated could begin and end with Harvard coach Tommy Amaker, who appears to be at the top of a very short list of candidates. Amaker would bring an ACC pedigree. He played for and coached alongside Hall of Fame coach Mike Krzyzewski at Duke. He also has coached at Seton Hall and Michigan. At Harvard, he has turned the Crimson from Ivy League also-rans into a powerhouse and three-time league champion. Amaker would energize the masses at BC, where interest in the men’s basketball program seemed to sag the last four years, evidenced by the disappointing turnout of 2,200 fans for BC’s home finale against Florida State. But, as it became painfully evident at the end of this season, Donahue no longer fit that profile. Asked when his confidence began to wane, Bates said, “It’s hard to pinpoint that. I think too often we get caught up in the emotional roller coaster of the season and wins and losses — you win at Syracuse and you lose the next game [at Miami, 69-42]. One of Donahue’s failings was he could not duplicate the success he had at Cornell, where he guided the Big Red to three consecutive Ivy League titles and three consecutive NCAA Tournament appearances, including a memorable run to the Sweet 16 in 2010. Donahue’s downfall at BC was rooted in his gambit to ramp up the Eagles’ nonconference schedule. “I think Steve has publicly said it was a miscalculation,’’ Bates said. “It was a very ambitious schedule and obviously it didn’t work out well for us . . . but based on this year, as an athletic director, I’ll be much more involved in the conversation of basketball scheduling, which I haven’t been historically. With a core group returning from a squad that went 16-17 in 2012-13, one which ranked as the most experienced in the ACC, Donahue played the percentages of the ratings percentage index (RPI) — a metric used by the NCAA selection committee to help it set the NCAA Tournament’s field of 68. But that move backfired as the Eagles went 4-9 in nonconference games, losing all five of their nonleague road games and going 1-3 in neutral-site contests. “Definitely, the wins and losses were a big part of the decision, no question,’’ said Bates, who met with the team Tuesday after Donahue broke the news to his players. “But even the more difficult challenge was — we’ve got signing day in April and November, and we’ll play a couple of games, but not enough to offset any rumors about his long-term tenure. With no incoming freshmen for the Class of 2014 to speak of, and one promising commitment from a blue-chip prospect for 2015, it would have made Donahue’s fifth season untenable, especially if, as team sources indicated, sophomore Olivier Hanlan, BC’s scoring leader, left for early entry into the NBA. When Bates and Donahue met last Thursday, as reported by Sports Illustrated, the AD said at no time did he give his basketball coach any indication he was safe to return for a fifth year. “When that report got out, I can only guess that it was speculation,’’ Bates said. Bates did say it was his great lament to have to part ways with Donahue, whom he described as “such a good man and a good coach.’’ Donahue was a basketball coach who rolled up his sleeves and helped incoming BC freshmen students move into their dorm rooms in the fall, and one who had hoped to return next season to coach those players he recruited as freshmen and see them flourish as seniors. Michael Vega can be reached at michael.vega @globe.com.